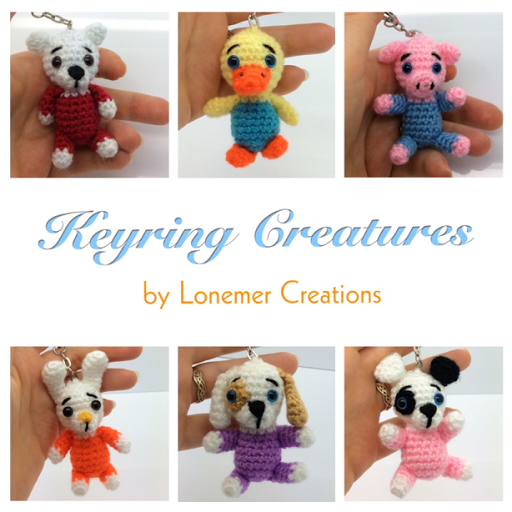 Welcome to my miniature world of Amigurumi Keyring Creatures! Keyrings can be very special, as they accompany us wherever we go and we can get very attached to them. These little fellows are designed with the specific purpose of brightening your day and making you (and others) smile. With them, you can feel warm and cosy inside regardless of the weather. Because of their cuteness and convenient size, they make ideal Christmas presents and stocking fillers, but also wonderful gifts for your friends and loved ones, regardless of the season. These creatures are very quick and easy to make, and they are suitable for beginners, as they involve basic amigurumi techniques, such as single crochet in the round, basic colour changes, and sewing different parts together. The body and the head are crocheted in one piece and they are the same for all animals. The legs are crocheted in the same way for all animals, apart from the duckling.